Featured Rental Properties of the Day! 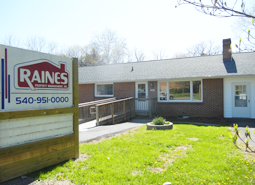 Welcome to Raines Property Management, where we offer a variety of housing options in Blacksburg and throughout the New River Valley. We have over 650 single family houses, apartments, townhomes, and other options to meet your needs. If you are a student, a professional, on a tight budget, or looking for an upscale home, Raines Property Management has the professional resources to be of service. Whether you are searching for a home to rent or if you need a firm to manage your property, let us put our thirty years of property management experience to work for you today. Effective January 17th, our new office location is at 1504 North Main Street. Please stop by to see us. We have added new staff and moved to a larger facility to better serve our customers. For after hours emergencies call 540-951-0000 or click here for instructions.